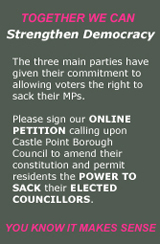 CASTLE POINT RESIDENTS will be unable to vote for United Kingdom Independence Party (UKIP) or British National Party (BNP) candidates in the local Borough Council elections on May 6th. Both parties have decided to leave the field clear for Spink’s Independent Save Our Green Belt Party on the mainland – and Spink’s Canvey Island Independent Party (CIIP) on the island. Local nominations closed on the 8th April. Canvey Island wards are all three horse races between CIIP, Conservative and Labour candidates. Thanks for your full response, and I already see some agreement. There are also some areas where our views differ. Clearly you and I are immune from the accusations surrounding MPs’ expenses, but not immune from the fall-out. I suspect that you, like I, have had some frank discussions on this issue on the doorstep. You correctly pointed out that the immediate response on expenses dealt with the over-claims. However, I do not believe it fully dealt with the issue of confidence, and it does nothing to address the issue of accountability. You have misrepresented my argument for change to the House of Commons voting system. I think you have come to the mistaken view that what I and the Government are advocating is the Jenkins formula, that is AV plus. Please be assured that I, too, believe in the importance of the constituency link and am also concerned about having two types of MP – hence my support for the Alternative Vote. This, I remind you, is the system where each candidate is ranked in order of preference, and where every MP will be able to claim that the majority of their constituents have voted for them. The Alternative Vote is not truly proportional, and arguably leads to stronger government. As to having some appointees in the second chamber – sorry, but as a passionate champion for democracy I can accept nothing less than a fully-elected body. Those wise heads you referred to should be able to secure nomination and election. As for reducing the number of MPs – I confess to being happy to look into this. I worry that this will make each MP a little more remote, I would also like to examine the detail on your proposal regarding transfer of powers to MPs, which strikes me as an argument for more, not less MPs. I am not a fan of hair-shirt politics, and want our MPs and ministers to receive proper pay. It may make a good headline to advocate ministerial pay cuts, but I do not see how it delivers better government. As to referendums and your accusations of cynicism: I do not think this is the proper place for a discussion on the pros and cons of the Lisbon Treaty, but I do remind you that Conservative governments so far have given the British no referendums, ever. Those with a passing knowledge of the origins of the American War of Independence will be aware of the rallying cry “no taxation without representation”. As sixteen-year olds can work and be taxed I subscribe to this two-hundred year old argument. (Telegraph) – THE UNION behind the British Airways strike is actively coordinating attempts to secure Gordon Brown another term as Prime Minister, a leaked email reveals. The email, seen by the Daily Telegraph, is from Charlie Whelan, a long-time friend and ally of the Prime Minister, and it reveals the degree to which the union is helping Labour’s election campaign. In the memo, which was sent last month, Unite regional officers are instructed on how they should rally Labour support in the workplaces and get supporters to make 10 calls a day to Unite members encouraging them to vote. Mr Whelan boasts that the union – which claims to have 2 million members – has been active in key marginal constituencies for the last year. He also urges his army of regional secretaries to get members to vote by post to ensure Labour’s vote is got out. The disclosure of the way Unite is attempting to mobilise party support comes as the row over the BA strike escalates. The airline last night said that four out of 10 flights would have to be cancelled for the first three days of the walk-out – due to start on Saturday. Gordon Brown yesterday condemned the industrial action as “deplorable”. But he still did not directly criticise the union as Lord Adonis, the Secretary of State for Transport, had done at the weekend. Mr Whelan is the political director of the super-union that is orchestrating the looming strike action that threatens to cripple BA services over Easter. The former spin doctor is now back at the heart of Labour’s operation and regularly speaks to the Prime Minister. It is also clear – that like Lord Ashcroft with the Conservatives – Unite is heavily involved in the fight for votes in crucial marginal constituencies. In the leaked memo Mr Whelan confirms: “We’ve been in touch for the last year or so with Unite members in the key parliamentary marginals. We’ve asked them their voting intentions and what issues matters to them. And he issues a rallying cry about what the Conservatives would do if they won the election. The spin doctor has admitted that Unite is actively taking part in the election fight in ways that previously unions – despite donating millions to the party – would not have done. George Osborne, the shadow chancellor, told the Daily Telegraph that Mr Brown should immediately stop taking money from Unite. He said: “This is a test of Gordon Brown and he is ducking that test. You cannot on the one hand condemn the strike while at the same time accepting money from the union orchestrating it. “The Unite union is becoming a party within a party. It is selecting candidates and running the campaign in the marginal seats. The Daily Telegraph has also established that Unite is using its multi-million pound political operation to “reclaim the Labour Party for the workers”. A union document has disclosed that Unite has given Labour £11 million since it was created in 2007 by the merger of the Amicus and Transport and General Workers union. Those two unions donated another £15 million in the six years before that. Amicus donated a total of £9.5 million and the TGWU gave £6.1 million. The combined total of £26 million of donations makes Unite and its component unions the biggest financial players in British politics. The Conservatives say the union is using its financial muscle to influence Labour policy. A report on the combined union’s financial strategy, prepared last summer, shows that Unite plans to use its money to enhance its political clout. Mr Woodley and Mr Simpson oversaw the decision to install Mr Whelan as Unite’s political director. The Unite operation includes a “virtual call centre” where union members canvass for Labour. Several Unite officials and allies have been selected for safe Labour seats at the general election, causing alarm among Blairite MPs. In the strategy paper, Mr Woodley and Mr Simpson, make clear that Unite is seeking to expand its sway over Labour. In the wake of the financial crisis, the report says Unite will “make sure that the Labour Party stands for fundamental re-regulation of the financial sector”. The Canvey Beat has kindly allowed us to debate some key issues on their forum, and I have been asked to kick this off. I shall begin with a subject that ought to be non-partisan, and we may even agree. Last year’s furore over MPs’ expenses raised a number of concerns over the integrity of our democracy. The Government set in motion a number of measures to address the misuse of expenses and allowances, and have committed to some fundamental change and discussions on modernising Parliament. Ours is the most ancient of Parliaments; a good look at how it works and how the voters engage is long overdue. Some, myself included, have argued that the MPs’ expenses row highlighted the lack of accountability in the vast majority of constituencies. The remedy is a voting system where all votes matter. I am no Johnny-come-lately on electoral reform – this has been a concern of mine for some thirty-five years. I am a member of the Electoral Reform Society and the Labour Campaign for Electoral Reform. If elected I will be pushing for change. I accept that change cannot be rushed, and that change must have the buy-in of the electorate; hence my approval of plans for a referendum on the voting system for the House of Commons. The result of the referendum will be a voting system that has the approval of the majority of the electorate, in my view a good way of not only achieving change, but also key in re-establishing trust. The introduction of the Alternative Vote to replace the current first past the posts system for electing MPs. The voting age lowered to 16. Do you agree that change is needed?.. (Independent) – GORDON BROWN wooed female voters yesterday by promising a new legal right for mothers to choose where they have their babies, including home births for those who want them. The Prime Minister previewed a Government plan to improve maternity services to be published tomorrow during an online chat on the Netmums website. Women could hold the key to the general election, as many have moved away from Labour since 1997, and the party has identified 53 seats where mothers could make all the difference. Mr Brown told Netmums members the Government would provide a hospital bed for new fathers so they could stay overnight after their babies are born. He also promised an extra 4,000 midwives by 2012. “Our maternity services have got better over the last 10 years, but sometimes I think we haven’t done enough to make sure they provide a really personal service for mums and dads,” he said. If mothers were denied the proposed “entitlement” to have their baby where they want, they could be allowed to go private with the cost met by the NHS. No price tag was announced, but Labour said it would implement the plan “as quickly as possible” after the election. The Mother’s Day web chat was part of Mr Brown’s election strategy of talking directly to as many people as possible without having his message filtered by an often hostile media. Earlier, he faced some searching questions when he came face-to-face with 16 undecided voters in the marginal seat of Stourbridge in the West Midlands, where Labour has a majority of just 407. The debate was staged by the BBC’s Politics Show. Aides denied the Prime Minister was repeating the “masochism strategy” used by Tony Blair at the 2005 election to allow voters to vent their anger over the Iraq war. “Gordon comes over well talking to ordinary people,” one said. One disaffected Labour voter compared Mr Brown to James Callaghan, who also became Prime Minister in mid-term, dithered about calling an election and then lost power, while another told him his “performance” at the Iraq inquiry “deserved an Oscar”. He also faced searching questions about NHS bureaucracy, jobs and adult education. But his questioners were mostly respectful and his answers calm.